This civilization is the result of successful interbreeding between Chinese immigrants and Malay traditions both in Malaysia and in Singapore. 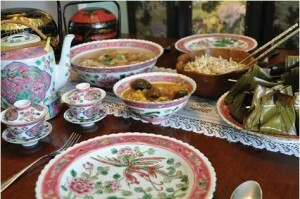 This Peranakan culture was beautifully illustrated in 2010 by an exhibition of the Paris Musée du Quai Branly. In Singapore, one should not forget to visit the beautiful Peranakan Museum. She is a widow with comfortable financial means, she could just be a “taitai” playing mahjong. But she does not lack energy and talent to develop her business. Food is essential for her. 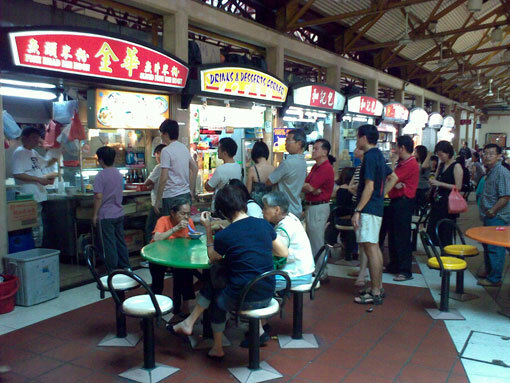 As said by Olivia Yu, “Food is the thing that unites Singapore.” Aunty Lee decrypts the characters in their approach to food, in their attitude to a buffet … The Peranakan cuisine is her area of excellence and an appendix of the novel lists “food courts” and “hawker centers” which are part of the attraction of Singapore and Malaysia as well as specialty restaurants in this Peranakan cuisine. One of the famous dishes is chicken “buah keluak”, an Indonesian nut which, not prepared, properly, can be toxic. Two people are poisoned with a buffet handled by Aunty Lee for a family that tries to save their heir with organ trafficking. She was born in 1961, she is not Peranakan and moreover … vegetarian. Her father is Hokkien, born in China, a division head of the Ministry of Health; her mother, born in Singapore from a family coming from Shanghai, was during forty years a math teacher. She began studying medicine but she soon gave up to the despair of her parents, to follow a course in English literature. Since 1987, she has written some thirty plays, some of which have been very successful and even rewarded abroad. Some of her plays deal strongly with feminist themes and herself married for 26 years to Richard Chan an official, is considered as openly gay. She has two dogs, practises yoga and … learns French! Her two novels include several gay couples, two lesbians in “Delight” and a gay couple in “Deadly specials” that prepare their union, their “commitment”. This is somewhat artificial because it is not really related to the plot, but it allows the author to criticize Singapore’s policy on the subject. What is rather unknown is that the Supreme Court of Singapore in October 2014 recognized the constitutionality of section 377a of the Penal Code punishing with two years in prison homosexual activities. Of course in practice discrimination is limited, the local Gay Pride was attended by 26 000 participants and websites, bars and specialty clubs are not closed as in Malaysia; however, nine people were sentenced between 2007 and 2013 under section 377a. 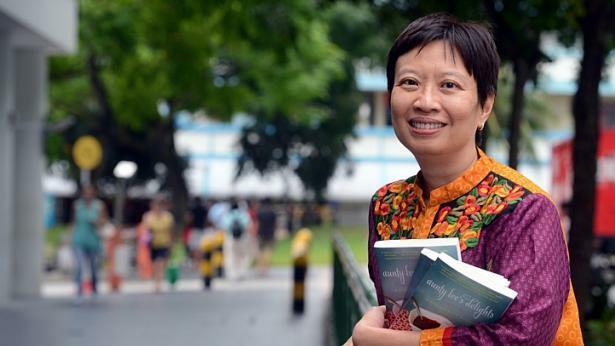 Ovidia Yu resigned last July from the Singapore Literary Festival committee to protest against the decision of the NLB (National Library Board) to remove three children’s books considered by some parents as having a homosexual content. I especially liked “Aunty Lee’s deadly specials” that handles many issues including organ donation and links with the mafia which in China, organizes this traffic. The relationship between police and citizens in Singapore are addressed without too much complacency. The book is full of interesting notations on the social behavior of different communities. Similarly, the attitude towards migrant workers including Nina, the Philippine assistant of Aunty Lee, is analyzed. Cherril, a air hostess who now assists Aunty Lee, is also an endearing character. But there is no question of political novels as those by Qiu Xiaolong; no real criticism against institutions or government. She does not intend, and this makes us happy, to write a “thriller”, even though Aunty Lee is sometimes in danger. It’s a pretty special mix, captivating but too long with many repetitions. Psychological elements of some characters, such as the deceased husband of Aunty Lee, who is her constant reference, are recalled well too frequently. Ovidia Yu, “Aunty Lee’s delights”, William Morrow, 2013, 270 pages. 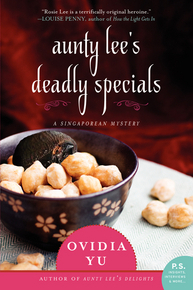 Ovidia Yu, “Aunty Lee’s deadly specials”, William Morrow, 2014, 360 pages.